Pristine Waters Car Wash is the ultimate, state-of-the-art vehicle cleaning facility. Located in Littleton, Colorado, our 6-bay car wash includes 2 automatic wash bays, 4 oversized self-serve bays, and 5 vacuum stations. We only use the highest quality soaps that are environmentally-friendly. For your convenience we have an easy-to-use credit card, gift card, and cash payment system. We'll keep your vehicles PRISTINE CLEAN! 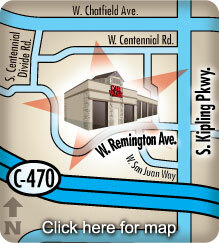 We are conveniently located at 10087 W. Remington Ave. Littleton, CO 80127 on the NW corner of S. Kipling Pkwy. and W. Remington Ave. Just 2 blocks North from C-470! We have the BEST touchless, automatic car wash in the industry! Click here to learn more about the cleaning system and all of our fantastic other services! Click here to learn about the damaging effects that MAG CHLORIDE can have on your vehicle! Pristine Waters Car Wash is your ultimate, touchless, state-of-the-art automatic car wash.
We offer a wide range of services from self service, to our touchless automatic car wash, to vacuuming and shampooing... meeting your budget and exceeding your expectations. Our modern, bright, well kept facilities are open 24 hours a day, 365 days a year. Perfect for all makes of cars, compact, mid-sized and full-sized SUVs, Hummers, pick-ups and duallys, RVs, boats, horse trailers, recreational trailers and even some tractors. The simple and easy-to-use payment system offers the convenience to swipe your credit card, debit card or gift card, as well as accept cash and enter discount codes. Our north vacuum station on the side of the building also has a carpet shampooer . The touchless, Kärcher CONTOUR automatic car wash efficiently produces high pressure water flow at 900 psi, while maintaining a 60 degree angle of cleaning power. The soaps that we use are the highest quality and safe for your vehicles and the environment. Each oversized self serve bay has a "High Flow" Chemical Foam Applicator Gun for dispensing Mag Away (Mag Chloride Remover in the winter), Bug Remover (in the summer). Also a multi-color Clear Coat Conditioner (Triple Foam). We also have a hand-held, high-velocity air vehicle dryer... the Air Shammee! In our #3 self-serve bay. With minimal effort, it produces a spot-free finish without ever touching your vehicle. HOME ABOUT US GIFT CARDS DISCOUNTS CONTACT USADD'L INFO 2017© Pristine Waters Car Wash. All rights reserved.